Hi everyone, I have my first real “rescue” situation as of Saturday. 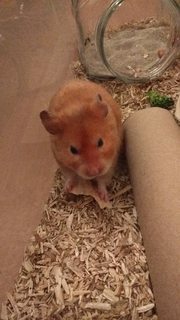 Spotted a hamster for free on gumtree and the pics were... concerning. So less than 28 hours later he’s in a very hastily pulled together bin cage in my spare room. I’m keeping him quarantined just in case, and to let him settle. He wasn’t with any other animals that I could tell and has no obvious health issues but better safe than sorry? Not sure how long is appropriate, about a week? Advice appreciated. This is the cage he was in, it was smelly and the door was tied closed because he can open it (a woodlouse could open it) and the lady I got him from had had him a month and said she was scared of him so I doubt he’s seen any outside cage time. The previous owner apparently had him a year in the same cage. I don’t think he could get up into that weird ball contraption, he’s quite big and struggled with the other tubes, and it was stiff as heck anyway so v little exercise there too. There is a lovely big Trixie wheel in the post for him as I didn’t have a spare but I think maybe easing him into exercise might not be a bad idea anyway? He’s a slow mover. I think what you're doing is great. If you have the money, I would advise taking him to the vet just for a quick check-up. And yes, leave him for a week unless he wants to socialise with you. Other than that, as long as you're following basic care needs, keep at it. I usually quarantine new hamsters for at least a week or two to be on the safe side but will extend it if a hamster sounds snuffly, has a cough, skin issues or is itching. 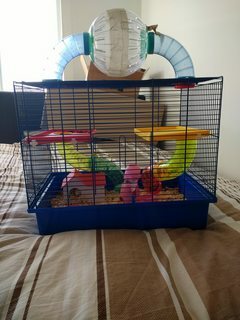 In terms of wheel use, if a hamster has not used one in a long time, I would normally ease them into it, starting with supervised sessions and then progressing to having it in the cage a few nights a week and then finally in their cage 24/7 but with monitoring for signs that they are becoming obsessive. Thanks all, that helps my confidence a little bit. He will be at the vet at the smallest sign of an issue but I don’t think I’d like to put him through the stress of a visit just for a checkup. Although the vets I use are the ones always recommended for hams in the area, and they’ve been very helpful, I don’t have perfect confidence in their expertise sometimes, particularly if I have no symptoms to give them. Teeth look fine, he eats well, nails are grand, ears look a little dry maybe so I’m on the lookout for symptoms of mites but nothing definitive yet, could not be described as crusty or flaky. Improved diet and not sleeping in a tiny plastic box might help their condition. I think it's usually two to three weeks for quarantine - ie in a separate room (I read Vectis posting that once). I guess just play it by earwith behaviour/handling? Some rescues seem to continue to be a bit independent and institutionalised, others, become tame and bond with you quite quickly. Charlie was always a bit institutionalised and he only spent 8 weeks in the pet shop in a tank without a wheel! Great to have your one liners back Shannon! Day 5: Wee man is moving a lot better, even managed a little vertical hop when he was scrabbling to get out of the cage during feeding time which is very positive. Less positive is that he's managed to stretch himself to reach the top mesh on the bin when he's standing on his sand jar (which he most definitely could not do before) and I've come in to find him dangling twice now. He's happy enough to be helped down and I've covered the sand jar with an eggbox since that's the only thing he could really hurt himself on if he fell. Anyway, his ears are looking a bit flaky so suspicions of ear mites are growing. There's no sign that they're annoying him in any way, they don't seem irritated, no waxy buildup or anything and I haven't seen him scratching. No signs of any fur loss or thinning anywhere else either (he's remarkably plush). So question is, at what point is it worth the stress of a vet visit to get this checked? When I'm sure it's mites? When it doesn't clear itself in a week? Most of my reading is telling me that demodex mites are ubiquitous and they only become a problem at times of stress or inhibited immune system (which would be now so soon after a move) so stressing him out more is not what I'd like to do right now if it isn't absolutely necessary. I'll try and get some photos tonight to see if I'm over or underreacting to this. My phone camera is garbage but we'll see. Funny you should ask about quarantine as I've got a blog post in the pipeline about that! I quarantine for 2 weeks minimum for new hamsters or those returning from loan. If in doubt I quarantine longer, or if they aren't settled enough to have their cage clean and health check before going into the hamster room. I've tightened up my quarantine a lot since last year. Oh poor thing - I didn't realise he was having moving difficulties. A bit institutionalised in his cage? I am sure gradually, he will enjoy the freedom of space and variety of different textures/places to go and be dozing on the sofa or eating sitting on your knee After he's out of quarantine. Personally I wouldn't stress about mites just now or do a vet visit just yet. Thank you vectis! Looking forward to the masterpost I'm happy taking the whole two weeks to be safe. The plan is to move him into the detolf once I get a new cage sorted for Jin (in the pipeline) so that timing will suit anyway. And yes I am being very careful, my upstairs is my room with the girls, then Goose's room and bathroom so it makes a handy little circuit for a handscrub after going in to see him. I really don't want to do a vet visit tbh, they're always at least a little bit traumatic for everyone, but I did want to check that my judgement is okay. I'm very wait-and-see about my own health and I don't want that spilling over!